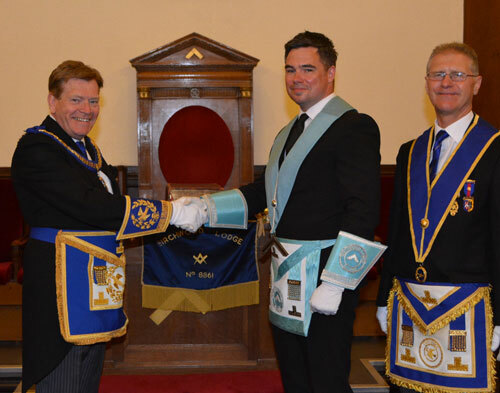 Almost 60 Freemasons attended the installation meeting of the Birchwood Lodge No 8861 to support and witness Mathew Crawley being installed into the chair of King Solomon for the first time. The lodge was extremely pleased and proud to welcome their principal guest Assistant Provincial Grand Master Kevin Poynton. Pictured from left to right, are: Kevin Poynton congratulating Mathew Crawley and David Hobbs. The lodge was opened by the installing master David Hobbs and the normal administration duties undertaken in the usual form. David sadly announced the death of John Barry, an honorary member of the lodge and asked for everyone to stand in silence as a mark of respect to departed merit. The lodge was opened in the second and third degree. The Assistant Provincial Grand Master Kevin Poynton was admitted in due ceremonial style, accompanied by grand and Provincial grand officers including Gordon Amos, Chris Eyres and Andy Barton Warrington Group Chairman, (on his first visit to Birchwood Lodge as a grand officer). Acting Provincial grand officers attending were Barry Fitzgerald, (at his first meeting as senior PrDGDC) and Stephen Clarke as PrAGDC (also, at his first meeting in post). David welcomed all present, saying it was a particularly great honour and privilege to welcome Kevin Poynton and to see so many very distinguished brethren attending this special occasion. He continued by saying he hoped everyone would have a most enjoyable evening. Kevin thanked David and the brethren of the lodge for their very warm welcome and commented that he was very much looking forward to the evening and witnessing the installation ceremony. He continued by saying he brought the sincere good wishes of the Provincial Grand Master Tony Harrison. David, as a matter of procedure and as a mark of respect, offered Kevin the gavel, which on this occasion he indicated that was delighted to accept and even more delighted to return it into David’s very capable hands. Bob (left) congratulating Mathew, his son-in-law. David asked John McIntyre to assist him by occupying the senior wardens chair, Charles Carr the junior wardens chair and Alan Gillard to act as inner guard until Barry Corcoran arrived, a little later. All the brethren accepted saying it would be a great honour. David explained that he was ‘standing in’ for Glen Screeton the current WM, who was unable to attend due to his wife Clare recovering from a serious illness. David read a note from Glen thanking the brethren for all their support and understanding during the difficult period he and his family were going through, wishing everyone their best wishes for the day and the future. David also passed on his thanks for the help afforded to him whilst standing in for Glen. Robert (Bob) Williams acting as director of ceremonies, presented Mathew (his son-in-law), to receive at David’s hand, the benefit of installation. Mathew was then installed according to ancient custom into the chair of King Solomon. The ceremony was conducted with all due humility, sincerity and reverence. The third degree working tools were explained by David Rogers, second degree by Michael Hamilton and the first degree by David Eccles. Mathew then appointed his officers for the ensuing year. The address to the WM was delivered with great dignity and feeling by Bob. Andy Barton, the group chairman delivered an exemplary address to the wardens. Kevin delivered the address to the brethren in an extremely polished and professional way, which completed the installation ceremony. 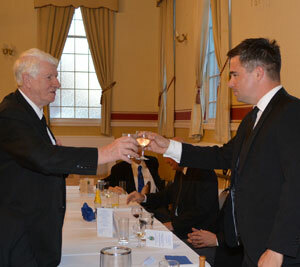 Bob (right) proposing the toast to Mathew as WM. 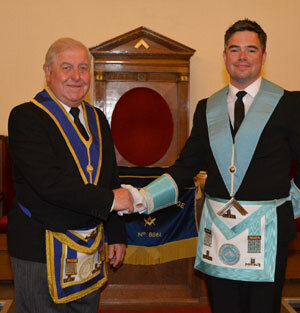 Immediately following the installation, Kevin on behalf of himself and the Provincial Grand Master Tony Harrison, congratulated Mathew on being installed into the chair of such a fine and friendly lodge, commenting that the ceremony was faultless and a pleasure to witness and thanked the installing master for his hard work. He also praised all the officers for the smooth running of the ceremony, the members of the lodge for their work and Bob as director of ceremonies. He also gave special thanks to the younger members for their work on presenting the working tools. He extended his good wishes to all present and hoped Mathew and all his officers would have a productive year and wished everyone the best of health to enjoy it to the full. At this moment, Mathew conducted his first duty which was to present the charity donations to Kevin. The donations were to: Masonic Charitable Foundation £600, Ecclesholme £300, St Rocco’s Hospice £275, The Cavell Nurse’s Trust £275, Cruse Bereavement Care Warrington £275 and The Adam Lewis Effect Foundation Warrington £275, providing a grand total of £2,000. Kevin received the donations saying how pleased he was to receive such a magnificent sum of money. He praised all concerned saying it was such a wonderful amount and thanked the lodge and brethren on behalf of the recipients, stating that the donations would be gratefully applied. Norman Pritchard (left) during the master’s song with Mathew. The hall catering staff supplied an excellent four course installation banquet. The meal comprised of a bruschetta with sautéed mushrooms, roast loin of pork with traditional accompaniments, fruit cheesecake with pouring cream, followed by a selection of cheese and biscuits. The meal was followed by tea or coffee. 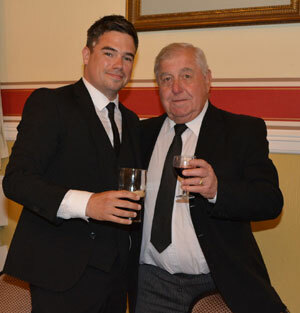 Bob, being Mathew’s proposer into Freemasonry and also his father-in-law, proposed the toast to him which was charged with great sensitivity, emotion and sincerity. Following the meal, a raffle was held which raised £207. The master’s song was sung by Norman Pritchard accompanied by Keith Dickenson. Kevin and Andy were presented with bouquets of flowers on behalf of the lodge. They all thanked the WM and brethren for the flowers and for a most enjoyable and memorable evening. Pictured from left to right, are: Andy Barton, Chris Eyres, Kevin Poynton, Mathew Crawley, David Hobbs, Gordon Amos, Stephen Clarke and Barry Fitzgerald. Story and pictures by John Starkey.